Just looking at his numbers, Chipper Jones had a forgettable final regular-season homestand. Actually, his performance was abysmal, going 1-for-10 for the weekend, with a lone single lucky enough to break through the infield during Sunday’s win against the New York Mets. But to everyone except for the third baseman himself — who noticeably struggled with his ongoing slump — his level of play was beside the point. 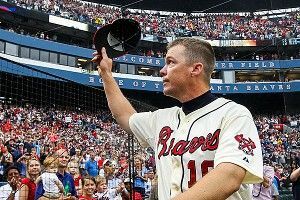 Braves fans at Turner Field were far more concerned with sending off their beloved icon with a celebration worthy of his 19-year, soon-to-be–Hall of Fame career. On Sunday, Jones’s mere presence brought the crowd to its feet close to 10 different times in a game where all he contributed was a hit, two walks, and a handful of routine defensive plays. Between Friday night’s tribute ceremony and Sunday’s final regular-season plate appearance, Braves fans unleashed one thunderous round of applause after another — every time Jones stepped onto the field, off the diamond, and even around the large no. 10 cut into center field’s grass. Turner Field saw three consecutive sellouts to end the regular season. The Braves have only sold out five games total in 2012, and on numerous occasions, attendance has dipped low enough for both Grantland and Chipper himself to notice. Considering this might have been the last chance to see no. 10 in person — other than the one guaranteed wild-card play-in game later this week — fans seized the potential final opportunity to pay homage to the modern legend. Before Friday’s game, the Braves honored Jones with a 30-minute tribute ceremony, featuring appearances by Governor Nathan Deal, Bud Selig, Bobby Cox, Braves president John Schuerholz, Brian McCann, and several others. The organization also outdid itself in the gift department, presenting Jones with a custom-engraved pool table from his teammates, a third base presented by Hank Aaron, a home plate made of Turner Field’s bricks, 10 local baseball fields to be refurbished and preserved in Jones’s name, and a trip to Hawaii. They also intend to give him his locker — yes, his actual clubhouse locker — custom installing it in his house after the season. To be fair, that’s probably a better option than making some poor rookie inherit his mammoth cubbyhole next spring. Jones had his own parting words for his teammates, organization, and fans — which he shared several times over the course of the series. The Braves’ weekend-long festivities capped off a season filled with gifts and tributes from numerous other ball clubs; everything from bratwursts to surfboards. According to Tom Glavine, Jones doesn’t particularly enjoy being in the spotlight like this. It wasn’t hard to see or hear what Glavine was referring to. As Braves general manager Frank Wren has observed Jones’s farewell tour this season, it has reminded him of working with the Baltimore Orioles during the 1999 campaign. That year, Cal Ripken Jr. came nine hits away from reaching the 3,000-hit club — with plenty of fanfare along the way. According to Baltimore Orioles pitcher and onetime Philadelphia Phillies hurler Randy Wolf, Jones garners near-unanimous reverence, even though he was a longtime division rival/victim. After Sunday’s 6-2 win, Jones acknowledged the tremendous support, but admitted he was ready to focus on this week’s series against the Pittsburgh Pirates as well as the play-in game on Friday — whether it’s versus the Cardinals or Dodgers. Gonzalez had asked Jones “two or three times” if he could rest the third baseman toward the end of yesterday afternoon’s game. Jones balked each and every time, not wanting to get distracted with the “tipping of the cap and standing ovations” until after the game. Max Blau is a staff writer at Creative Loafing and contributes to the Atlanta Journal-Constitution, NPR, and Paste Magazine.